Tinnitus is a non-auditory, internal sound. But patients can use real, external noise to counteract their perception and reaction to tinnitus. Sound masking can cover the sound of tinnitus, while more advanced therapies may provide more robust relief. Use ATA’s Health Professional Directory to find local doctors who can connect you with the right sound-based treatment options. “Sound therapy” is a broad term that may be used in many ways, depending on the specific product, clinical setting, or individual clinician. In general, sound therapy means the use of external noise in order to alter a patient’s perception of, or reaction to, tinnitus. Like other tinnitus treatments, sound therapies do not cure the condition, but they may significantly lower the perceived burden and intensity of tinnitus. There are many devices that offer different levels of sound therapy. Below is a list of general types of sound therapy products, and a discussion of their specific mechanisms of action and reported efficacy. These are devices or applications that provide generic background noise — often white noise, pink noise, nature sounds or other ambient, subtle sounds. The noise generated by sound machines can partially or fully mask a patient’s perception of tinnitus, providing relaxation and temporary respite from the condition. The “traditional” sound masker is a single-function table-top or bedside device with several pre-set sound options. However, almost any sound-producing device can be used for masking purposes, including personal media players, computers, radios, and TV. Even electric fans or table fountains can provide masking sounds. In general the most effective masking sounds are those that elicit positive emotional responses in the patient. Sound masking devices are typically only effective during or immediately after active use; they have very limited longer-term effectiveness in reducing overall perception of tinnitus. Hearing aids can be classified as a type of sound therapy because they augment external noise as a way of increasing auditory stimuli and diverting attention from the perception of tinnitus. A comprehensive review of hearing aids as a tinnitus management tool is available here. While commercial-grade sound machines deliver a generic sound selection, a variety of medical-grade devices provide more customized sounds designed around the patient and his/her tinnitus. These devices play special notched-music or algorithmically-modified sounds in which specific frequencies and tones are emphasized — often at a level not consciously perceivable by the listener. The reported function of these modified sounds varies according to the specific product. Unlike standard white noise machines, notched-music devices are generally worn intermittently (only during defined therapy sessions or times of predictable acute need, such as before bed or immediately upon waking), and provide lingering benefit after the device is turned off. Also, unlike standard white noise machines, notched-music and modified sound devices may, over time, alleviate the perceived burden of tinnitus — even after they are turned off. By facilitating habituation these products may help the patient naturally “tune out” the perception of tinnitus. The reported clinical efficacy of modified-sound and notched-music devices varies by product, but in general these devices appear to provide some level of relief to many patients. Optimal results typically require at least some patient counseling and education in addition to the use of sound devices. Many hearing aids now come with integrated sound generation technology that delivers white noise or customized sounds to the patient on an ongoing basis. These devices combine the benefits of a hearing aid with those of other sound therapies, and are particularly well suited for tinnitus patients with measurable hearing loss. Also, because of the portable nature of these devices they can provide semi-continuous use and more consistent benefit throughout the day. The efficacy of these combination devices varies, depending on the device, the integrated sound feature, and the particular patient. And, although research data is not definitive, the professional consensus seems to be that hearing aids with integrated sound generators benefit a significant number of patients. With countless apps and little direction, it can be hard to figure out which sound and sleep apps might help with tinnitus and/or getting a good night’s sleep. By clicking in the image below (which will open into a PDF), you’ll find the top picks of apps compiled by an audiologist with tinnitus. 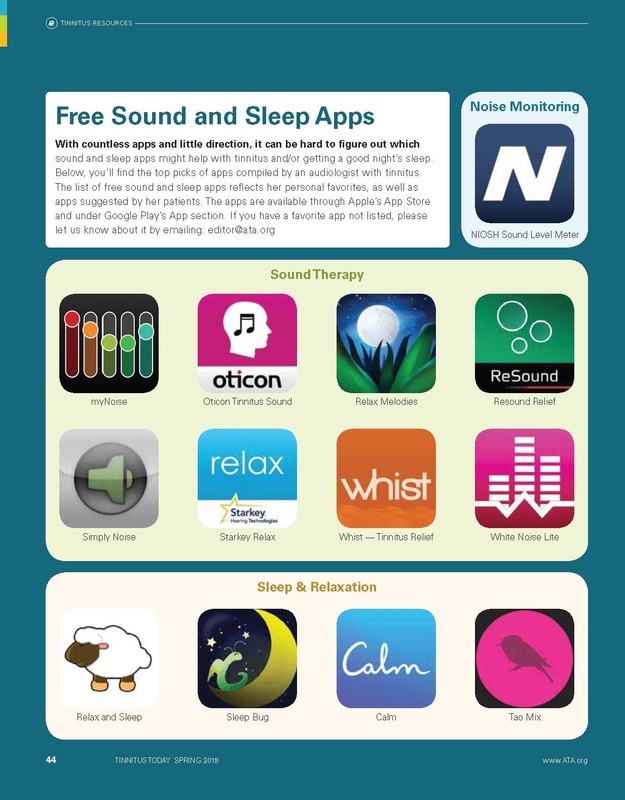 The list of free sound and sleep apps reflects her personal favorites, as well as apps suggested by her patients. The apps are available through Apple’s App Store and under Google Play’s App section. Price: Hearing aids and medical-grade sound therapy devices can be expensive and are often not covered by insurance plans. Tinnitus Symptoms: Patients should consider their lifestyles and the times when they most require relief from their tinnitus. If tinnitus is mostly an issue immediately before or during sleep, a bedside white noise machine may be sufficient; if tinnitus is an ongoing, 24/7 concern, a more portable option may be preferable. Sound Sensitivity: Patients with hyperacusis or another form of sound sensitivity may encounter some discomfort when using sound amplifying devices. Education and Support: Nearly all sound therapy systems work best when they are coupled with a program of supplemental patient education and counseling. Hoare, D.J., Searchfield, G.D., Refaie, A.E. and Henry, J. (2014) “Sound Therapy for Tinnitus Management: Practicable Options.” Journal of the American Academy of Audiology. 25: 62-75. Hobson, J., Chisholm, E., El Refaie, A. (2012) “Sound Therapy (Masking) in the Management of Tinnitus in Adults.” Cochrane Database of Systematic Reviews, Issue 11. Art. No. : CD006371. DOI: 10.1002/14651858.CD006371.pub3.